PHOTO CAPTIONS: 1. 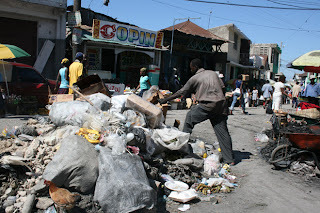 Garbage is still a huge problem in Haiti, 2. Some nice old architecture, but mostly concrete block, 3. 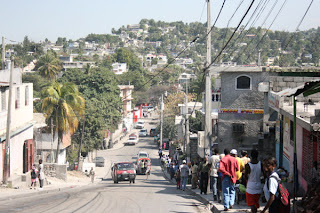 Haiti is more mountainous than Switzerland, 4. 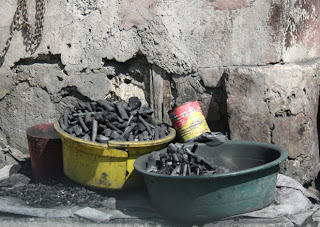 Haitians cut down tons of trees, mainly to make charcoal for cooking, 5. This means: "Don't pee here, you pig." It's a newly constructed booth for Carnival next weekend, 6. 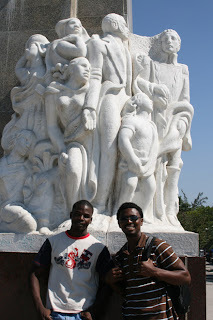 Andre and driver Wilson at heroes statue in main plaza, 7. Me with Andre's beloved grandma, 8. 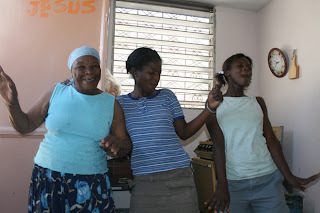 Grandma kicks up her heels with some of Andre's cousins, 9. Andre and his Aunt Gertrude, 10. Cousin Barbara and Aunt Gertrude, 11. Neighbor GooGoo and cousin Johanne, Andre's mother Maude with her mother, Andre with nephew Joel, 14. 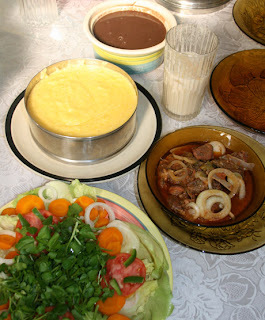 Polenta, salad, goat stew, and pureed beans. Yum! Andre’s mother doesn’t like to talk about his father. Andre grew up knowing very little about the man who left his mother before he was born. Supposedly, when he found out that Maude was pregnant he told her to abort the child. That ended their relationship forever. Andre spent his early years on his grandfather’s ranch in a tiny village called Duval. 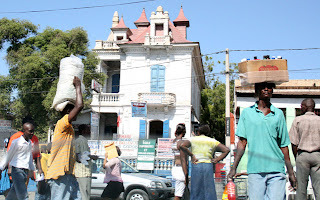 Meanwhile, his mother moved to Port-au-Prince and within a few years, she met and married his stepfather. They have four children – Marjorie, Johnny, Reginald and Beatrice. Marjorie is married and has a one-year-old son named Joel. Johnny just finished his police academy training and is working in the capitol and living at home. Reginald and Beatrice are still studying. 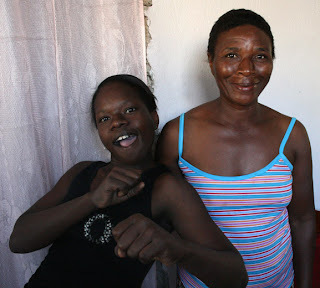 Majorie’s husband Lesly is from the same village in southern Haiti as Andre’s father. By coincidence, his father and Andre’s father were friends. I used to think that Andre’s aunts backed up his mother’s story that his father was dead so he wouldn’t look for him. But Lesly confirmed that it’s true. Lesly knew Andre’s father, an older half-brother, and a female cousin. Andre’s paternal grandparents died just a few years ago, but Lesly knew them as well. A few nights ago we were talking to Lesly about Andre’s desire to meet some of his biological family, particularly his brother who Lesly says has the same nose and eyes as Andre. He’s about 40 and taller than Andre. For the first time, Andre learned his father’s name: Pierre. On Andre’s birth certificate his maternal grandfather is listed as the father, which made it confusing when we filled out the application for the fiancé visa. Which father should we use? His grandfather who raised him and is listed on the birth certificate? His stepfather? Or the birth father whose name he only recently learned? We finally settled on the grandfather. Lesly also revealed a surprising fact: Pierre was a soldier! 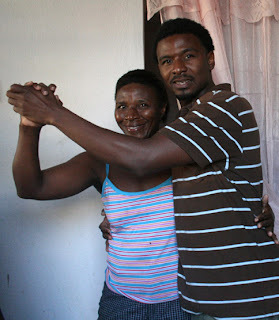 Andre has wanted to be a soldier all his life, having grown up with his mother’s father, a retired soldier. And when Clinton sent 20,000 Marines to restore order to Haiti, 14-year-old Andre couldn’t help but be impressed. The Marines were so professional and organized. He still dreams of joining the U.S. Marines. Imagine me -- a complete pacifist and anti-war protestor --married to a Marine. But my attitude is everyone should go after their dream, otherwise he’ll be an old man, still regretting that he never was a soldier. But I wonder how he would ever survive a war. 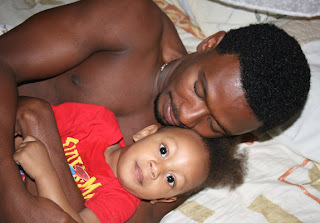 Andre thinks Santo Domingo is too dangerous to go out at night. 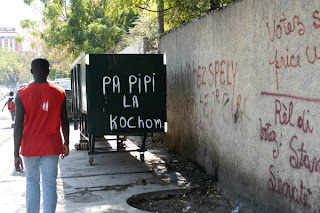 The next day, Lesly did what he promised – he got in touch with Andre’s cousin in Les Cayes, the town we visited last year on our way to Ile-a-Vache. She revealed another new piece of information that not even Lesly knew: Andre has a half-sister in the U.S. or Canada. Lesly doesn’t know whether she is older or younger than Andre or how we can get in contact with her. But today he promises to call the brother. It turns out he moved back to the capitol, so he’s only about 30 minutes from here. Andre is very anxious to meet him, exchange emails, and see if he has any family photos. Andre has never seen a photo of his father or anyone else on that side of his family. 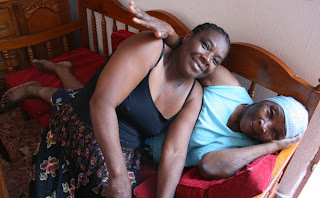 When Andre’s stepfather first learned that Lesly’s family was friends with Andre’s birthfather’s family, he didn’t want Marjorie to marry Lesly. He felt that Andre’s father was a bad man, so his whole family must be bad, and any friends of them would be bad too. 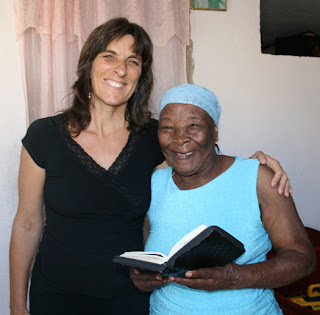 But Lesly is such a great person, very intelligent, hardworking, and devoted to Marjorie and their son Joel. Fortunately, Andre’s stepfather finally agreed to the marriage. I just hope he doesn’t get angry at Lesly for putting Andre in touch with his relatives. Neither Lesly nor Marjorie is worried about that, so I hope they’re right.